Home Lambert Is Paul Lambert’s Long-Term Project Compromising Aston Villa Short-Term Ambition? Is Paul Lambert’s Long-Term Project Compromising Aston Villa Short-Term Ambition? 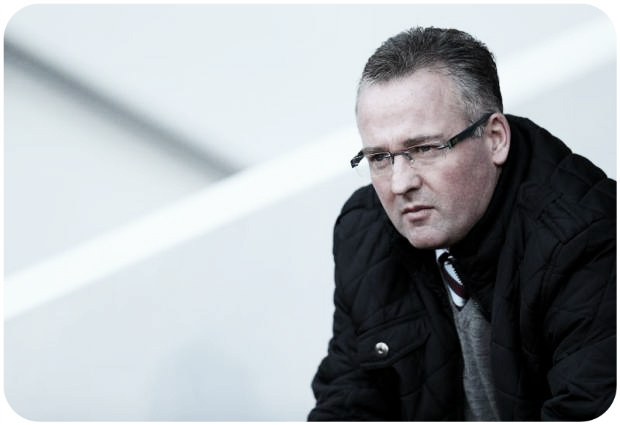 Does Aston Villa short-term ambition have to be compromised by Paul Lambert’s long-term plans? Aston Villa supporters discontent with Paul Lambert has started to grow over some of the limited performances they have been witnessing from the team in recent months. While the team is six points up on corresponding fixtures from last season, recent performances suggest that won’t last for long. The Villa bosses’ stubbornness in interviews increasingly riles them too. While the lack of patience shown with Lambert by some fans is rash (his was always a long-term project) the question that does beg itself is what is Villa’s ambition in the short-term? If Paul Lambert was the manager of a newly promoted team his reputation would be undisputedly glowing. What he’s done at Villa, namely purchase younger players from lower leagues and overseas on low-end price tags and wages, would have served well the likes of Crystal Palace, Hull and Cardiff. If a club’s aim was to stay in the Premiership and slowly build a team that could be competitive and establish itself in the league, without taking the risk on paying out huge wages on journey men pros, then Lambert’s approach is spot on. Such club’s supporters would afford him patience and in turn, rally behind the underdog make-up of his young team. At Aston Villa though, supporter expectation and ambition are invariably pitched a little higher. The problem is the club’s ambition has in recent decades has always been questionable. Remember when Gareth Southgate and Ugo Ehiogu left Villa for Middlesborough citing the club’s lack of ambition as their prime motivation? One of the best recent examples of Villa failing to grasp the benefits of acting in the short-term was when John Gregory had Villa top of the league in the 1998/99 season and in the form, that when you include the last 11 games of the previous season, would have seen them as league title contenders (if all those games came within one season). The story goes, when Gregory requested the one or two players to give the squad the necessary strength to mount a title challenge after Christmas, Doug Ellis said no. The midfielder Muzzy Izzet was one of the players ear marked by the Villa boss. Surely a manager who had got Villa to the summit, should have been granted such a purchase? Such a scenario is typical of the restraint to Villa ambition in recent decades, that has constantly left Villa supporters frustrated. If you don’t stay on the top of the mountain, then the only way is down it, as Villa have found in subsequent lean times. Hope came in the form of Lerner’s cheque book, but unfortunately that time they got the short-term all wrong, with alarming wages shelled out on some decidedly average players. Villa made headway up the mountain, but unfortunately, it seemed their guide in Martin O’Neill had taken them up the wrong route to reach the upper plateau. When the club reached a dead-end, off the Villa manager ran into the wilderness leaving the club to slide back down. As I wrote at the very start of Lambert’s tenure, in the current climate of splash the cash football management, which Villa were unable/unwilling to do now, he had a plan to make progress back up the proverbial mountain. It was a long and dangerous way round, using a route that not many clubs would dare take. Considering his zero tolerance cull and the introduction of several Premier League novices, the first season of Lambert’s reign was always going to be about Premiership survival. It was at times a white knuckle ride, but ultimately a success. As previously mentioned, while his drastic model would have served a newly-promoted team well in terms of expectations (there was also a cup semi-final), after such a season of consolidation, Villa fans wanted more this season. But how much more, can we realistically expect? Keeping Christian Benteke for the season ahead raised Villa fan’s expectations. It also provided Villa with a chance of making some kind of short-term impact while the overall rebuilding took place. If an attacking midfielder or a bigger midfield presence was brought in (even on a season’s loan), it would have surely benefited the effectiveness of having Benteke in the ranks. Instead, the biggest purchase in the summer was made in Libor Kozák. It could be argued that it was good to start to bed in Benteke’s replacement, but what about the now? If you keep your best asset, why not maximize his potential, rather than investing in covering his departure? With a season’s experience in the bag, one benefit seemed to be the improvement of the much maligned Villa defence. That problem seemed to be solved, with an improvement in results even when faced with a tough bunch of fixtures to start the season off with, but suddenly Villa got unlucky with injuries. Jores Okores was the new signing expected to make the biggest impression in improving the team, his injury was a massive blow. Yet, Ron Vlaar responded and stepped up to improve on his less than convincing first season. There’s no doubt his absence in the last two games against Fulham and Manchester United was pivotal to the two loses. Of the other new recruits, it would be difficult to argue that any of them have improved the first eleven this season. Antonio Luna is still an average left-back at best at the moment; like Joe Bennett, more experience can only help his cause. Is Bacuna better than Lowton at right-back? Nope. Does Tonev add anything to the midfield? Not yet, he doesn’t. Up front, Helenius hasn’t had a sniff, and while Kozák has added a functional presence when called upon, he seems to be a squad player at the moment. Increasingly this season Villa have been found out and especially struggle against any team with a disciplined, capable and experienced midfield. Counter-attack successes have only came against decent midfields, if the opposition breaks rank and gets into fire-fight with Villa, by over committing players forward (see Arsenal, Manchester City and Southampton). With the alarmingly OBVIOUS lack of dimension in the Villa midfield and lack of ability to dictate a game, Benteke has been rendered increasingly a frustrated figure. If Lambert’s plan is to evolve the current squad with minimal additional investment (i.e. supplementing the squad with the type of young inexperienced players he’s brought in so far), then while it may bare fruits in two or three seasons time, it underlines Villa distinct lack of short term ambition. Lambert’s policy of ‘young and hungry’ to gel the foundations of a tight-knit team is a sound one, only when players with proven pedigree and quality are added to up the level of the team’s capability as they go along. You only have to look at the astute loan signings Roberto Martinez made at Everton in both Gareth Barry and Romelu Lukaku. Yes, their wages cost a bomb, but it’s only a short-term spend. No five-year drainage like Shay Given’s £55,000-a-week. Lambert might argue that having such players on those wages would demotivate his close-knit younger players on considerable less wages. Maybe, but surely it would inspire them too and give them increased confidence in the team’s potential. There is no substitute for ability and experience, if the player’s attitude is good. Certainly Villa have been crying out for such a player in the middle of the park. While I agree with Lambert’s overall ethos, with the January window approaching, he needs to address the short-term, because tomorrow may never come. You also have to question PL management skills. Lowton has proved to be a good signing. He got last years POS and has a few bad games and PL bombs him out and plays a player that is not a defender (bacuna) in his place. Lowton set his sights high and hit them. Few bad games and dropped. His confidence is down and now on uphill climb. But is a good player who PL has knocked down. Where as players like Weiman, el hamadi, continue to play when they are as bad and we have cover for. I do think he has bought badly but I do think a Brian Clough/Alex Ferguson type manager would get these kids going…..even Martinez/Rogers manager……but Lambert? No…..Clueless, tactically inept and seems weak….he has had 18 months and says he needs another 18……Let him go ……before he takes us down! that’s big of you giving a manager with a limited budget 18months to buy a whole new squad which is what is needed . As for Fergie or anyone else getting better performance from the players that complete & utter tosh ! the team is unbalenced coz of the injuries & the need to be reinforced in certain areas , But that knowledge can only come from the team playing together ! After today it’s clear new players are needed , not to replace players but to fill gaps in the squad . Talk has it that Okore will be back before the end of the season , but that is not soon enough . That leaves midfield where a strong DM would take some of the pressure off the defence & release one of the 2 currently being used to support the attack . That might solve the problem which many say requires the addition of an AM to the squad , or would it ? But what players might we get ? The problem is there isn’t much depth to the talent in the team. If Benteke, Vlaar, Okore or Guzan are injured, then the spin is suddenly very weaken, as we are experiencing now. A decent DM & AM would transform the team. Only if there is another peak to go up! Excellent analysis.Lambert should be given time;we are a club in decline,and if he cannot work magic with us then no one will. Poor article littered with references to decades in the past and a former owner! You blame his lack of short term planning and then remind is of what happened with the money thrown at O’Neill! Make your mind up! One thing I agree with is that he has to be given time as do the players or we’ll end up like Spurs. One thing we don’t want is to go back to the sacking days of Houllier and Mc Leish. Get behind them and stop moaning! The references to past decades provide context of Villa’s stifled ambition. O’Neill’s reign is the precursor to current events. So all very relevant. This ‘long-term project’ that has been mooted, has never declared what it hopes to ultimately achieve. There is no long-term, if you don’t address the short-term, as you go along. As for your last sentence – what a load nonsense! So, are you one of these blinkered fans who think supporters should just put up with what they’re served up and shell out their hard earned cash no matter how bad things are? To support the name Aston Villa is to question it and want the best for it, not just to make do. So is it ridiculous so say that for the first time in approx 130 yrs WBA have greater spending power? Or that Everton can bring in player that villa can’t? With regards to Learner financial strategy, when he took over villa, Doug had the club on a pretty sound footing. We now pay the wages of the bottom tier of the premiership and top tier of the championship. And we are getting player in of that quality! Colin you can disagree if you would like, but without a couple of outrageous results this season (Man City and Southampton), we would be struggling again. Ultimately is Learners club, he will do what he likes. but fans need to manage their expectation ! I agree that this whole perception of some fans that Villa have no money is rubbish. We’re a major club, the insane wage bill has been cut, they are now privy to a massive increase of TV revenue and the club have also enjoyed increased gate receipts this season. Villa have spent money, but Lambert has been principled in who he’s spent it on. I’m just hoping that now he has his foundations, he’ll add a couple of decent proven players to supplement his plans. It’s time all villa fans realized that as a club we are in big trouble. There is a simple fact that buying players for £2-4m is the budget for a championship side. It is a myth that Lambert has found loads of young talent, one by one they are getting found out. We see on forums that Delph or Westwood should be close to the England squad, but in truth they are miles away from that standard and there are other better players who are not getting pick for the squad who would be next in line. In fairness Benteke is finding it hard this season a combination of other teams being aware and planning for him (he seems to be getting a fair amount of rough stuff this year) and he would appear to have a little less appetite for the fight this year. But he won’t be the first player to have a poor second season. It looks like learner is going to sell, he is making the financial position of the club attractive to any investor. My measure of where villa are as a club, is to compare them to Everton and Tottenham who are similar clubs. I am not ensure that either club would want many of villa’s players if they were offered. I totally agree with the inflated opinions of Delph and Westwood. Lowton too was instantly considered a potential England RB. No yet they’re not. And yes, Everton, Spurs, Newcastle is Villa’s ballpark of comparisons and supporters shouldn’t forget that! If we had a player capable of a bit of magic, like Merson, I don’t think the players would resent him getting a better salary. They would learn so much from a top drawer seasoned pro with genuine quality. I think it has always been a problem at Villa that we have good young talent coming through, but they reach a level and stop progressing. I’m sure it is because they don’t get to train with genuine world-class (or even European-class) talent on a day-to-day basis. I agree. I also think that just a couple of decent players (in the midfield) would transform this team.